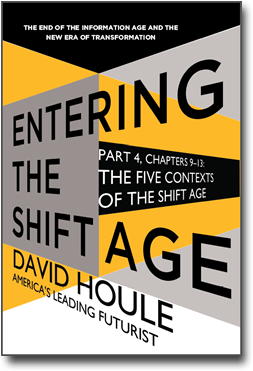 "The Five Contexts of the Shift Age" is eBook Three of “Entering the Shift Age". This eBook introduces the Five Contexts of the Shift Age that will profoundly change humanity over the next 5-20 years. eBook 3 encompasses the Introduction and the first five chapters of Part Four- The Future in the Shift Age. One of the differences between the Information Age and the Shift Age is that in the Information Age the cliché was “content is king” and in the Shift Age it is “context is king”. The contexts in the Shift Age are many and sometimes hard to discern. In this ebook I present the five most significant contexts of the Shift Age. These contexts will shape much of our future, how we think and how we live. Much of our social, political and economic thinking will be determined and acted upon due to these five contexts. These five contexts will either be guides or if we do not fully understand their significance, our limitations in the next 20 years.